A mother’s bond with baby can be a wonderful, powerful, and (in many cases) instant connection. But what if it isn’t? The bond between parent and child is a special, and very important, attachment that is formed. It allows parents to instinctively care for baby and for the child to learn to trust. In fact, children who have a strong bond with their parents are more likely to become happy and independent adults. That being said, there is no “normal” when it comes to a baby forming a bond with its mother. 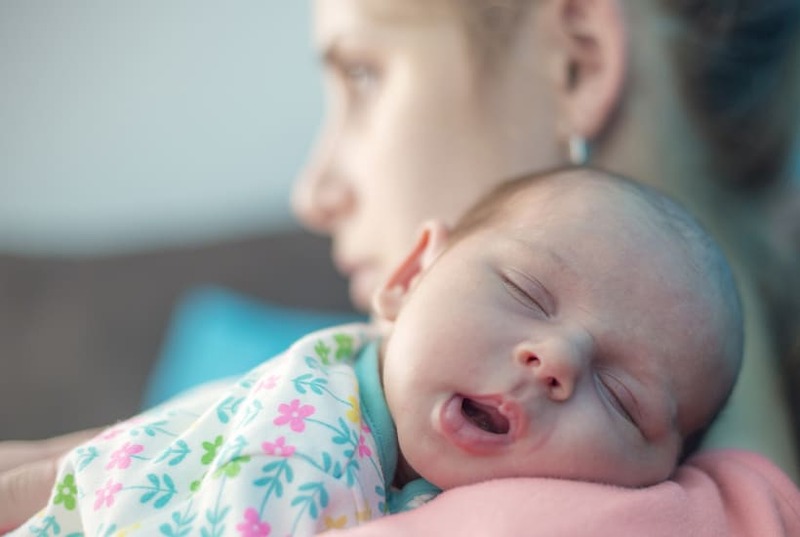 Assuming that a bond with baby will form one specific way can be damaging to the parent-child relationship and may make a mother feel like they are failing or doing something wrong. IS BABY NOT BONDING WITH MOTHER NORMAL? Many of my friends who had given birth warned me about these extreme emotions I would feel. I knew all about the mood swings, the pains, and (most importantly) the intense connection I would instantly develop with my child. While I didn’t look forward to the agony of labor, the thought of meeting the baby I had carried for over nine months and forming this bond kept me going. But the reality was that no one could have prepared me for the emotions after giving birth. They tried to, but those preparations set up expectations that almost caused me to spiral. During labor I endured countless contractions, suffered through a failed epidural, and then finally pushed until I felt the relief of a 7 pound weight leaving me. Less than a minute later, they put a dirty, wiggly baby on my clean hospital gown. It was a cute baby, in a generic newborn sort of way. It just didn’t feel like my baby. I didn’t have this magical instant connection with my newborn the second we made eye contact. Instead, I felt like I had spent hours laboring and pushing out a bowling ball. As a prize, they handed me the next baby that came off the conveyor belt. Don’t get me wrong, I cared for the baby. I wished it well and attended to him, but it didn’t feel like mine. And I wouldn’t say I loved him during our hospital stay. That realization pains me so much to say now. At this moment, I love my 4-year-old son with all my heart and (most days) I can’t possibly imagine life without him. The reality of the situation is that it took me many sleepless weeks, the better part of 2 months, in fact, to develop a true bond with my baby. The entire time I felt guilty that we weren’t closer. “Don’t you just looooove being a mother?” My visiting friends would ask me. “Did you ever imagine you could love something so little this much?” My mom inquired. I nodded and pretended to smile. In reality, I had no idea, and I couldn’t help but feel there was something very wrong with me. Why didn’t I love my child? Where was this bond everyone was talking about? Didn’t my baby deserve to have a mother that loved him? Turns out, it’s normal for moms to instantly connect with their child. However, this delayed form of bonding is completely normal too. 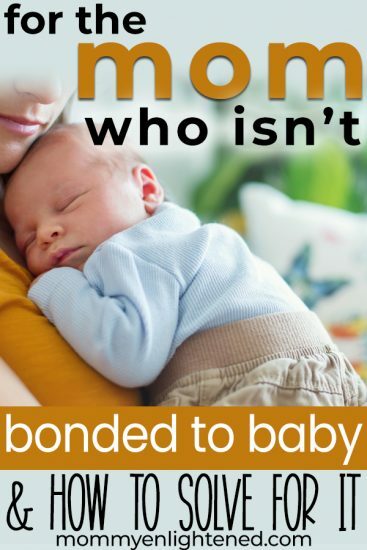 Not only is there no right way to bond with your baby, but there also isn’t a right amount of time. Sometimes, like I previously mentioned, the bond between parent and child forms immediately the second they lay eyes on their new bundle of joy. But up to 1/5 of parents feel no attachment to their newborn following delivery. In this second group of parents, weeks or months may pass before they feel that strong and caring bond. Bonding can happen actively or passively. Some examples of active bonding would be mom going out of her way to touch or sing to baby. On the other hand, passive bonding occurs when you are naturally taking care of an infant by feeding, changing, or rocking them to sleep. There are even physical signs of bonding, such as a mother’s hyper-attuned sense of hearing to her baby’s cries (or the ever popular let-down of breast milk). 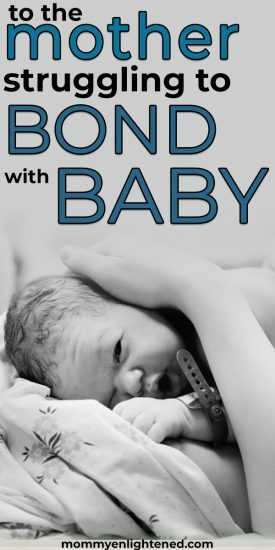 But remember, at the end of the day there is no right way to bond with baby. It took me months to bond with my child and I had none of these risk factors. It’s important to not stress, understand that it’s all normal, and concentrate on keeping your baby happy and healthy. For the majority of mothers, the strong and intense bond with baby will come with time. Since this process can take anywhere from a few minutes to several months, the timeline can often be unpredictable. Many moms who are on the longer end of the spectrum want to have an active role in encouraging this relationship. Designate one or two feedings as “unplugged” sessions by turning off the phone and TV. Try to make eye contact, tickle those tiny toes, or rub their back. Be sure not to pick an overnight session as you’ll likely be cranky and want to keep baby in a calm state. Don’t worry about doing this for every feeding session, you need a break too! Listen to baby snort and breathe while you’re drifting off to sleep. Smile when you hear them hiccup. If you feel the need, reach over and gently comb their hair with your fingers. If you feel the urge to be close to your baby, embrace it. Don’t listen to anyone telling you what you “have” to do when it comes to caring for your baby, concentrate on doing what feels right. If it feels right to respond to every cry and whimper, do it! Don’t suppress those natural instincts to nurture, cuddle, or even hold your baby while they sleep. Or maybe you feel a calling to swaddle your baby up tight and lay them down in their crib to nap, and that’s completely fine too. Don’t let anyone tell you how to parent, find your own way and develop the bond on your terms. Trying to “do it all” is a surefire way to get stressed and resentful of the baby after they are born. If well-intentioned friends and family members come over and offer to help, let them! Tell them the truth – you need help with dishes, cooking, laundry, or vacuuming – NOT holding the baby while you do those chores. Postpartum recovery is for you to bond with baby, so let your spouse, mother-in-law, best friend, etc make dinner because you’ve got snuggling to do! The only exception that I would ask someone to hold the baby is to take a nap. Sleep makes everything better and a cranky mommy can’t bond with baby. Related:What Does Your Mother-in-Law Think About Your Parenting? Don’t leave baby in their PJs all day, every day. At least twice a week, dress up baby in those adorable (albeit unpractical) overalls with matching shoes that your aunt gave you. Take lots of pictures and enjoy your baby. Undress your baby down to the diaper, cradle them in a towel, and start gently rubbing lotion across their tiny body. Baby massage is a fantastic way to bond with baby and has multiple health benefits including regulating baby breathing and heart rate. After the massage, cuddle with some skin to skin time before getting baby dressed again. Remember how the sound of your baby’s heartbeat was music to your ears during your prenatal visits? Well now you have the luxury of listening to it any time you want! Swaddle your baby up tight and hold them close, listening and feeling for that steady beat in their chest. While you’re there, take a big whiff of that amazing and intoxicating fragrance that is newborn baby. Supernatural is the best show on television (*swoon*), and how you spent hours picking out the perfect neutral shade of seafoam green for their bedroom wall color. Narrate your day: how you accidentally added too much milk to your coffee or you have to run back to the bedroom to grab slippers because your feet are cold. Your baby loves to hear you talk and you’ll start to develop a relationship. Try to keep doing the fun things you used to do before having a baby. Spend weekends in the city, just bring baby and a stroller. Go to your monthly wine club with baby in a sling (side note: I did this and one of the ladies there showed me how to breastfeed while wearing a sling, total game changer!). Or if it’s an event where bringing a baby is not conducive, try to leave them at home with a trusted caregiver. The more you let your baby hold you back from things you love to do, the more resentment and bad feelings can get in the way of you bonding with baby. Don’t worry about the classics lullabies, break out some of your favorites! Love Bruno Mars and Shakira? Sing them to baby! Better yet, turn on the tunes and (gently!) dance with them. Before bed, try some fun alternatives to lullabies. My personal recommendation is “Can’t Help Falling In Love” by Elvis Presley; I challenge you to sing that while rocking your baby and not cry. Those early smiles and giggles can often warm even the coldest of hearts, so try to be silly with toys and different faces to elicit one of those precious and intoxicating laughs. Don’t be too hard on yourself if they remain stone-faced, newborns can be stubborn. WHAT POSTPARTUM EMOTIONS ARE “NORMAL”? You name the feeling and it’s more than likely a normal way to feel after having a baby. Feeling overwhelmed with emotion? Normal. Feeling underwhelmed with emotion? That’s normal too. The emotions after giving birth completely vary from one individual to another, even though the hormonal changes after pregnancy that women experience are actually quite predictable. You know that new organ you grow during pregnancy? Yep, the placenta. That placenta makes a bunch of hormones for the entire pregnancy (including the ever popular progesterone and estrogen). After the placenta is delivered during birth, your body’s level of these hormones instantly plummets. Those immediate hormonal changes after pregnancy cause a whole bunch of fun side effects – hot flashes, hair thinning, and those wonderful “baby blues”. How women respond to these hormone changes can vary, and can even be different after the same woman has another child. So “normal” can be a roller coaster ride of moments of pure elation to extreme sadness. You may cry proud and happy tears to see your baby turn over on their own, only to be followed by a uncontrollable sad sobbing at how fast they’re growing. Yep, totally normal. Unfortunately, I can’t talk about not bonding with mother and postpartum emotions without discussing postpartum depression. Postpartum depression is also a cause for not bonding with baby, a serious one. It can be hard for women to distinguish between normal feelings of sadness and anxiety with that of postpartum depression. There are many signs to look out for. If you are feeling sad or overwhelmed more than happy, if you have lost interest in activities that were once enjoyable, if you think about harming yourself or your baby, or have any other worries – you should reach out to your obstetrician-gynecologist right away for a screening to discuss your concerns. It can be a fast progression from general sadness to something more serious, so it is imperative you stay alert. There is no shame in postpartum depression, only in not taking care of yourself and not having your baby’s best interest in heart. If many months have passed and you still haven’t developed a caring bond with your baby, that’s also a reason to contact your doctor for possible psychological or health issues. However, if you’re in the early days, just give it time and be sure to get your snuggle on. You haven’t failed as a mother just because you aren’t constantly consumed with feelings of love. After all, it can be hard to form a relationship with a newborn who can barely keep his eyes open, much less make eye contact. Trust your parenting instincts and you’ll develop a bond with baby before you know it. This post was written by Jo, one half of the team behind The Moms at Odds. She stands behind their mission that there are multiple right ways to parent and those differences should be celebrated, not shamed. Jo is a full-time mom (two young kids 19 months apart! ), small business owner, and wife. In her limited spare time you’ll either find her blogging or enjoying a glass of wine.